The Daredevil of the (admittedly excellent and highly entertaining) Netflix series is a bad guy, but it’s got nothing to do with being a vigilante. In fact, despite the way he continuously looks down on them, he’s worse than Punisher, Stick, and Elektra. Why? Because while they merely kill people, Daredevil tortures people. And I don’t mean just one or two people, I mean *all the time. * There is hardly a single episode where Daredevil is not shown inflicting physical pain or threats of imminent death in order to extract information from his enemies. Aside from a handful of instances where he gets information from a friendly police detective or the expedient use of superhumanly acute hearing, torture is the primary way by which he gains information throughout the series. One gets the impression that, if he refrained from torture, he’d never have even located the Russian gangsters from the beginning of the first season, let alone taken down Kingpin and the Hand. A great detective he is not. In the show, Matt Murdock (Daredevil’s alter-ego) is portrayed as a devout, albeit troubled, Catholic. His religion is supposed to be one of the things that guide his actions as a vigilante, preventing him from sinking into the abyss of vengeance seeking and violence for violence sake. 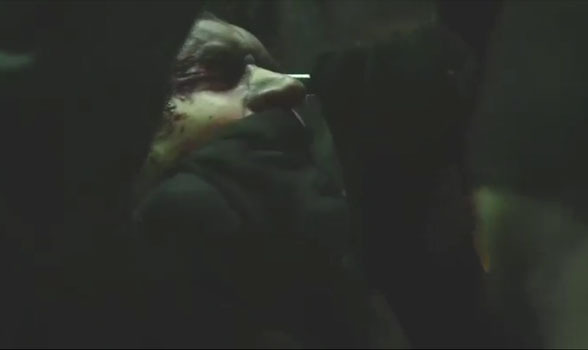 In one scene late in season two, he is pushed to his limit and suggests to the Punisher that, in this one instance, the Punisher’s way of doing things (that is, to kill people) is the right way. As he makes this reluctant admission, he blesses himself with the sign of the cross, as if to ward himself against this temptation or to ask God’s forgiveness. But the Catholic Church does not teach that it is always and everywhere wrong to take another man’s life. The use of lethal violence in defense of self and others (to give but one example) is considered legitimate. This does not stop Daredevil from condemning the Punisher, his former mentor Stick, and his former lover Elektra for their very frequent killing of provably violent and well-armed thugs. He shows contempt for them even when they kill someone who presents an immediate threat to their life. For instance, late in season two, Stick orders the assassination of Elektra, his former student. When the plot fails, Stick is not in the least bit remorseful, and instead reaffirms his dedication to kill her. Is Elektra permitted to kill to save her own life? Not in the eyes of Daredevil! There are plenty of other instances like this throughout the series. But not Daredevil. He doesn’t even blink. If a defeated opponent gets too mouthy, he has no problem leaning on a broken leg or stepping on a wound. If his agonized victim takes a bit too long to answer him, he’ll snap a finger or three and promise more. In season one, he asks a nurse(!) how to inflict the most excruciating pain on a tied-up and incapacitated hitman (by stabbing him in the eye, it turns out). During the commission of these evil acts, Daredevil does not bless himself or even look ashamed. He apparently doesn’t even think these mortal sins are worthy of confessing. Compare this to the Punisher, the character set up to be Daredevil’s dark side, when he faces a similar situation after escaping from torture at the hands of a notorious gangster. When pressed to give details about the massacre of the Punisher’s family, the defiant gangster refuses and insults the dead for good measure. Punisher simply kills him. Not a laudable act, and arguably an injustice, but at least understandable as an act of passion, and a far cry from the inhumanity of Daredevil’s habitual employment of torture. Amidst this depravity, Murdock cultivates a self-righteous streak a mile wide and a thousand feet tall. He takes a hard line against other vigilantes interfering with “his work” in “his city,” lies to his friends, abandons the people who saved his life and protected his secret identity, and betrays his business partner. When he is confronted about this loutish behavior, it’s always the other person’s fault. They just don’t understand or appreciate his great sacrifice to save the soul of Hell’s Kitchen. Murdock plays up this phony martyrdom so much I half expected him to drive nails through his hands and feet. But all of those traits just make him a flawed character. Flawed characters are interesting and can still be heroic. Overcoming those flaws is part of what makes them a hero. But someone who routinely engages in inherently evil acts like torture (and shows not the slightest indication of discomfiture over it) cannot be a hero. He is merely a villain masquerading as one. Matt Murdock really does have the devil in him, and as of right now, he seems perfectly fine with that. Addendum: If it’s not bad enough that Disney is giving us a ‘superhero’ who embraces torture (let that sink in for a moment! ), they’ve also given us a show where torture is extraordinarily effective. I could be forgetting something, but I can’t think of a single instance where Daredevil tortured someone who didn’t have the vital information he needed. No victim ever lies to him to throw him off, or just tells him whatever he thinks he wants to hear to make the suffering stop, as typically happens in real life. Nope, in this piece of fiction, torture is 100% effective, far more so than actual investigation and police work. Also, I would be remiss if I didn’t link to a couple of other good articles that already addressed this topic, one at Reason and the other at The Good Men Project. Blog Catholic, comics, Daredevil, Elektra, Hell's Kitchen, Kingpin, morality, Netflix, New York, Punisher, Stick, superheroes, the Hand, torture, vigilantes. permalink. I think he feels guilty about what he does, that’s probably why he hasn’t given up on his life and just devoted it fully to Daredevil. I think the no killing rule has more to do with his father than his faith, even total garbage gangsters have families. His problem is rage conflicting with his morals. When he gets into the darkness of the kind of crime that goes on in the city, there’s that primal justice instinct that triggers in him and beating a man half to death is all he can do to not beat him fully to death. Murdock is an angry dude, It’s not just that one man took his father away from him, he feels that the city itself took him away and he has to fix it himself with his fists. I think that was why the Punisher is so relevant to his story. They think differently but along the same lines. I’ll admit, he always manages to brutalize the people with info, but honestly that’s kinda true of the comic. He’s no Batman in Detective Comics, he’s the Devil so it makes sense.